Intro: Pay close attention. What you’re about to see if Bible Prophecy being fulfilled. 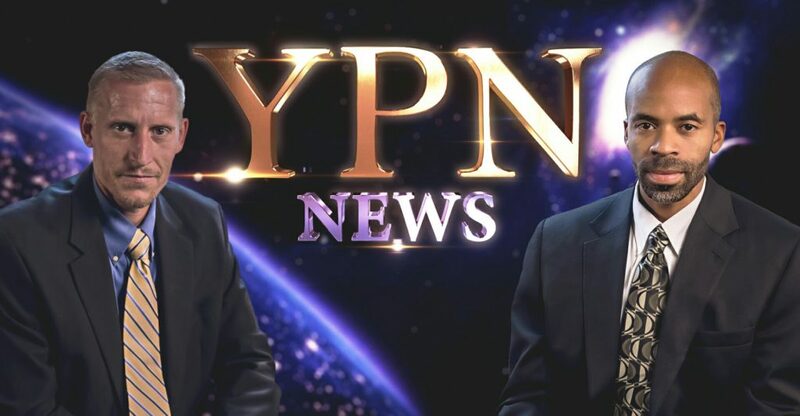 Caton: Welcome to another edition of YPN News bringing you news as it relates to Bible Prophecy and foretold by Yisrayl Hawkins. Well we’ve got more extreme weather in the forecast, so-to-speak, war games and warnings of war from one nation to another. Caton: But we’re gonna first start off with the Sierra Nevada mountain range, a 400 mile range of mountains has received massive amounts of snow that has taken a little edge off the drought, but it hasn’t gotten them out of the woods. And it’s done this without first leaving slippery and impassible roads and fallen trees in its wake. And of course more warm rain is on its way bringing with it the potential of torrential flooding in the area. Jeff: That flooding has already taken hold in some western states along with high winds and mudslides in California and Nevada. The governor of Nevada has declared a state of emergency and two people have died as a result of flooding. In Reno Nevada, over 1,000 homes have been evacuated as days of rain and snow made its way down the Truckee River. People who were left behind spent their time stacking sandbags to try to protect homes and businesses. Caton: Throughout the region heavy rains caused some drivers to become stranded. One twelve year old girl was rescued from an overturned car and a cab driver lost his life. Both vehicles ran off the road and became submerged in very frigid waters. Yosemite national park was placed under a mandatory evacuation. Lake Tahoe residence cleared trees off of roadways and filled sandbags to protect against a rising Yuba river. Jeff: For the first time in history the United States has added a bumble bee to the endangered species list. The rusty patch bumble bee has almost disappeared from the US over the last 20 years. And three other bees could also soon be added to the list. Brigida Santos, an RT correspondent said that according to the US fish and wildlife service, the rusty patch bee population has declined 87% since the late 1990’s. At one time they could be found in 28 states now they can only be found in 13. Caton: The US fish and wildlife service issued a statement saying, “the species, now balancing precariously on the brink of extinction, has become the first-ever bumble bee in the United States– and the first bee of any kind in the contiguous 48 states – to be declared endangered” Since the bees have been placed on the list of endanger species, resources can be allocated to save the dying population. As a note, these bees are very important because of course they are pollinator bees and they are responsible for pollenating a 1/3rd of the crops. Jeff: Wildlife service has estimated that they contribute 3 billion dollars-worth of pollination services in the US alone. Scientist speculate overuse of pesticides and climate change a cause of the decline. The other three species of bee considered to be added to the list is the Franklin bumble bee which may already be extinct, along with the Western and Yellow Bandit bumble bees. So three more that they might consider adding. Caton: It’s kind of scary to think about. The fact that those insects are responsible for pollinating the foods we depend on are actually decreasing in numbers. Which means food could possible decrease as well. Corn and corn bi-products are consumed by hundreds of millions of people on a daily basis. GMO corn has become increasingly more common and GMO companies say is equivalent in safety to non-GMO corn. But a new study published in Nature magazine by Dr. Michael Antoniou has proven that to be false. Round-up ready corn NK603, a Monsanto product that’s considered Glyphosate resistant or tolerant. Tests revealed it was safe to consume and be served around the country. Those tests were performed by Monsanto. Jeff: Well the new study finds that the test was ambiguous and not accurate. Dr. Antoniou studied NK603 crops and non-GMO crops for two seasons. One batch of crops was treated with Glyphosate and the other was not. This was done to study genetic modification instead of the applied herbicide. Researchers found that GMO corn had large amounts of toxic substances in them which could escalate allergic reactions in those who have food allergies. Caton: Experts say that in order to get the long-term effects of what GMO corn is doing to us more independent studies need to be done. Now Round-up Ready corn is a type of corn that’s engineered by Monsanto to resist massive amounts of the Round-up herbicide which makes round up the number one chemical that we’re being exposed to. Everything from cotton, corn, alfalfa, sugar beets, all of the top crops have been modified to have this herbicide resistant trait. Jeff: In fact food isn’t the only thing to worry about, even our drinking water has Round-up in it. In fact rats fed Round-up Ready foods with 400,000 times less the amount what’s allowable by regulators in our food. Caton, this tiny amount that the rats are fed is equivalent to what we’d get in our foods every day. They got this fatty liver disease which correlates with liver and heart disease and diabetes. Basically the chronic diet related diseases that Americans have been plagued with for many years. Caton: That’s been on the rise as well. In fact those studies were done by Monsanto themselves and regulators could have stepped in at that time but nothing was done, according to Alexis Baden-Mayer a political director for the Organic Consumers Association. One of the reasons that she said studies are hard to come by on these GMO crops is because Monsanto holds the patents, first off to these crops and of course Jeff Monsanto is one of the largest funders of our university system here in the United States. Jeff: It’s hard to think that it’s not biased when you’re the ones behind all the studies and giving all the money. Caton: Well a lot of people are asking questions now. Jeff: As a note in case you’re wondering, corn is in virtually everything we eat from multi-ingredient foods to meats. So in order to ensure some level of safety for you and your family you have to look for non-GMO project verified or organic foods. Caton: Well, the incoming President is also proposing to modify along the US border, our Chief Correspondent Larry McGee has been following that story as well as several others for us. Larry, what do have? several nations that are also said to be surrounding Russia along its western border, including Bulgaria, Romania, Hungary, and Estonia. The operation was reportedly announced by the US in response to concerns voiced by the Baltic States regarding Russian aggression, but some European nations see the move as dangerously provocative, and are reportedly angered by the maneuvers that are slated to be conducted for nine months along the Russia border. Prevent war, by binding [nations] in a rules based international order. Today, he says, that order is under grave stress. The causes of crises, he stated, are interlinked; and the UN’s response has remained fragmented. All of this was contributed during Mr. Gutierrez’ first address to the UN Security Council since taking office this month. The leader believes the governing body is in need of an overhaul in regards to its approach to preventing wars, and has pledged to the UN’s ability to mediate to conflicts- with the ultimate goal of preventing them as opposed to merely responding to them. The urging comes at a time when the Security Council is dead locked over several major crises in nations such as Syria, Burundi, and South Sudan; the former Refugee Chief believes the organization has lost too many opportunities to prevent conflicts, due to mistrust among states…For YPN News, I’m Larry McGee, Caton, Jeff, back to you. Caton: Well regard to that wall Jeff, it’s interesting because the Mexican President is saying, ‘no way. We’re not paying for a wall.’ Of course, the incoming President-elect Trump is saying we’re going to have you foot the bill. So I guess we’ll see how things take place in the next coming months. Jeff: Well earlier this week RT asked author and activist David Swanson why the claims of alleged Russian hacking got so much attention in the mainstream media despite the lack of concrete proof or any evidence at all. Mr. Swanson responded, “I think the desire for an explanation for how Trump became President that doesn’t blame the Democratic Party or the establishment as a whole. I think the fear and the demonization of a foreign target, in this case Vladimir Putin, as Xenophobia.” And of course, xenophobia Caton, is that fear or hatred for strangers or foreigners or of anything that is strange or foreign. So their trying to demonize, their words, Russia and Vladimir Putin. Jeff: How could the US deny China access to those islands? Gregory Poling, with the center of strategic and international studies explained to CNN that the US would have to start with a naval blockade. But that wouldn’t be all as China has air capabilities as well. With four different air strips and enough hanger space for a full line of fighter aircraft they would have to consider China’s Airforce. This is out there on those man-made islands. They’re pretty built up right now. Caton: We reported on that not too long ago. However that’s not all. Satellite imagery shows these islands are equipped with advanced air defense and anti-missile systems as well as anti-aircraft guns. Since these statements from China were made Pentagon officials have been calling on China to reduce tensions. Analysts are also worried about escalation with the biggest fear being an accidental conflict. Caton: Hoh pointed out that making this enemy out of Russia is just another way of breeding fear in society and making them feel there is a need for a strong military presence overseas. But as RT news anchor, Kevin Owen pointed out, “you can (only) poke the ‘dog’ so often and it’s going to snap back at some point. Jeff: Our final report takes us to the confirmation hearing for James Mattis. Last week he testified before the Senate Armed Services Committee to become the new Defense Secretary under President-elect Donald Trump. In this clip from the hearing, the Chairman, Senator John McCain questioned Mattis to see what his position was concerning the current relationships with President Putin, Russia as a whole, and the Chinese government. Let’s watch. Jeff: I guess they definitely want someone in there that’s going to be along their line of thinking. Well, certain leaders of this world have been pushing this new world order for quite some time. What they fail to see is that in a nuclear war…there are no winners. The Nations are angry and on the brink of war. One wrong move or slip up could erupt into an all-out nuclear war. As war plans are being drawn up and heated words exchanged, Yisrayl Hawkins and a dedicated group of workers are publishing plans for peace and words of kindness that have the ability to change the hearts and minds. Plan for your future by getting involved today. Contact the House of Yahweh and when you do don’t forget to request your free Prophetic Word Magazine and monthly Newsletter. Here’s how.